Monster Loves You! ($0.99) is the story of a monster, a story your choices help tell. The first collaboration between Radial Games and Dejobaan Games lets you decide how monsters live their lives: rampaging, caring for each other, or just plain old causing a fuss. You begin your life as a Morsel, a tiny speck of potential floating in a vat. It’s there your story begins, and at each step you direct it. Are you going to be the sort of monster that begins life by floating passively, by kicking your little Morsel legs to the surface, or by hunting and killing the weaker Morsels in the pool? Each choice has consequences, helping to build the kind of monster you’ll become. The consequences are rarely far-reaching, however. Monster Loves You is an interactive story, but it’s not a branching narrative. Your choices affect the sort of monster you’ll become, not the world you live in. If you behave compassionately, you’ll be seen as a kinder monster. If your choices are vicious ones, you’ll be seen as ferocious. Cleverness, honesty and bravery are also ranked, and so is your fellow monsters’ respect for you. These choices are presented in stages. At each stage of life, you’re given a bunch of scenarios to choose from, and a countdown of days until you reach your next phase of life. Each scenario takes a day, and gives a few things back: an interesting addition to your life’s story, a few choices, and, depending on how you approach the situation, a boost or hit your personality stats. Building stats high enough can open up new approaches to monstering. If you live well enough to get through the big tests in a monster’s life, your decisions become truly important: the stuff that decides the future of both monster- and human-kind. It’s never all that difficult to see where your choices will lead. Run around gobbling up human children and you can be certain the humans won’t like you much. Treat them with kindness and there may be a chance for peace. After playing through once, it’s easy to massage your decisions toward the ending you want to unlock. Between that and the limited pool of scenarios for each life stage, the game can get a little repetitive. If it weren’t so unrelentingly charming, that might be a bigger problem. That’s the thing about Monster Loves You: it makes itself easy to love. The cadence and tone of its storytelling, the cheerful music and colorful environments—it’s a pleasure to play around with. Its world, too, is well thought out – little touches bring it to life. 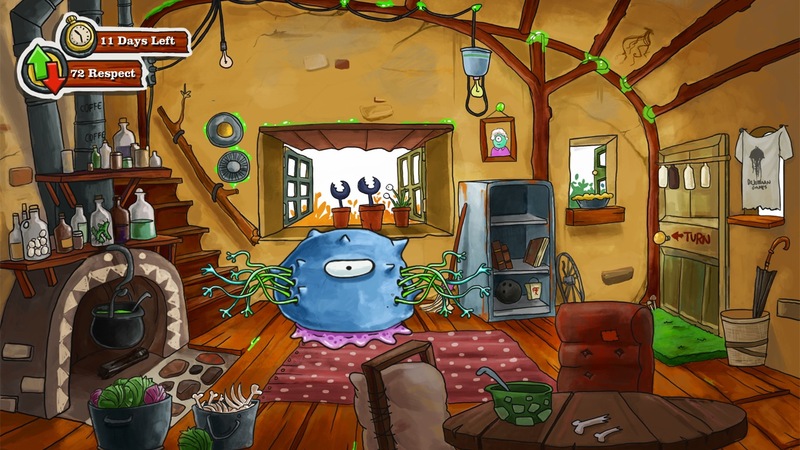 Monster Loves You could have been a virtual pet, concerned with the day-in and day-out care of monstrous life. Instead it’s concerned with higher matters—virtue, morality and the choices that define us. You can play it dark, or you can play it light. Neither is held up over the other, and both are lighthearted and occasionally even touching. Still, the game is a little too shallow to stand up in the long-term. Its charm will carry well past the point where its actual interactions run out of steam. These little monsters have lives worth observing, and playing with them is a good bit of fun for a time. Like their little lives, however, all good things must come to an end—and both monsters and Monster Loves You run down a little too soon. Devour Hansel and Gretel. Save Little Red Riding Hood. Eat the Three Little Pigs.